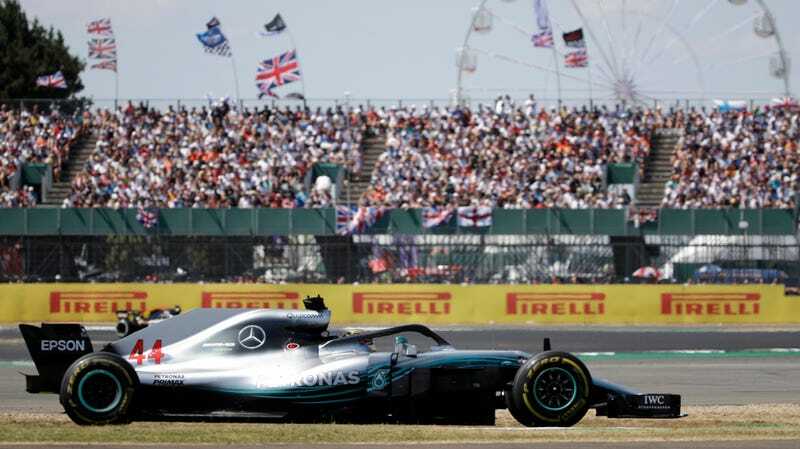 After setting a new lap record pace in qualifying (video below) and nabbing the pole position for the starting grid of his home Grand Prix, Lewis Hamilton was flying high as the red lights went out ahead of the 52-lap Formula One sprint at Silverstone. It only took three corners for everything to be completely upended. First, Hamilton has a little of himself to blame, as he got a very poor start off the line and was beat to the first corner by Sebastian Vettel’s Ferrari, but the heaviest share of blame is to be levied at Kimi Raikkonnen who tipped Hamilton into a spin, causing him to drop down to 19th behind both Williams. That opening lap was exciting, but watching Hamilton work his way back up through the field to finish on the podium was a rollicking good time. He’d dispatched with most of the backmarkers within a couple of laps. Once back up into the points paying positions, each successive pass became a little harder. Where his team had failed him in last week’s Grand Prix, this week they worked their asses off to make sure Hamilton had the best emergency strategy possible. Things definitely fell his way, though, as he’d started the race on a set of Medium tires and he managed to make them work much longer than the competition. There were also two safety car periods in this race, shortly after each other, that allowed Hamilton to stay out to regain precious track position. At the front of the race, Mercedes teammate Valtteri Bottas was fighting with Seb Vettel for the lead with an interesting thrust and parry battle that rivaled any I’ve seen in F1 for years. As the time wound down, it was Vettel who came out ahead, making a daring late-brake move down the inside of Bottas with scalpel precision. Bottas fell behind a well-recovered Hamilton to third, before being passed by Raikkonnen to push him off the podium after leading a large chunk of the race. That would be how the podium finished, with Vettel gaining a further 8 points in his championship lead over Hamilton, and Kimi taking the final podium position. After an amazing battle like that to recover 18 positions in a single Grand Prix, you’d think Hamilton would be ecstatic about the work he and his team had accomplished. After a quite Anglo-centric crowd had cheered on the defending champ all weekend, you’d think he’d be happy to smile and wave to his loving gathered masses. Unfortunately, Hamilton showed his primadonna tendencies again by refusing a post-race interview, simply walking away when Martin Brundle requested he say a few words about his mega recovery.